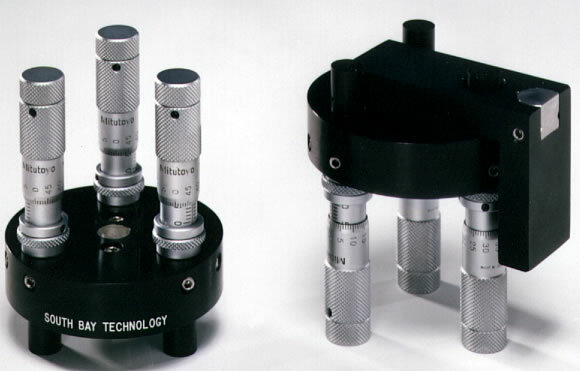 The Model 590 Tripod Polisher® was designed to accurately prepare TEM and SEM samples of pre-specified, micron-sized regions. For TEM samples, this technique has been used successfully to limit ion milling times to less than 15 minutes and, in some cases, has eliminated the need for ion milling. Although this technique was designed for preparing semiconductor cross-sections, it has been used to prepare both plan-view and cross-section samples from such diverse materials as ceramics, composites, metals, and geological samples. Optional Accessories Item # Price Enter Qty. Parallel Polishing Mount with pyrex insert (used with basic Tripod base) 02-03060-01 72.00 Qty. Parallel Polishing Mount 1.25" dia. S.S. (used with basic Tripod base) 01-03080-01 41.00 Qty. Planarizing Tool for feet resurfacing 02-03061-01 226.00 Qty. X-Section L Bracket Assembly 02-03062-01 155.00 Qty. Ion Mill Stage for SEM Stub Includes: 02-03063-01 SEM Stub Model 59001 203.00 Qty. 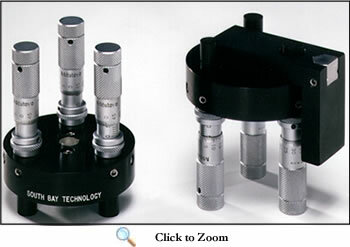 Wedge Polishing Mount Includes: (1) 01-03077-01 Clamp and (5) 01-03076-02 Rods Model 59002 145.00 Qty. Part # Price Enter Qty. Slotted L Bracket (used w/ 01-03077-01) replaces 01-03067-01 and 01-03094-01 01-03090-01 185.00 Qty. Pyrex Wedge Polishing Stub (used w/ 01-03077-01) 01-03076-01 17.00 Qty. Pyrex Wedge Polishing Rod (used w/ 01-03077-01) 01-03076-02 24.00 Qty. Plain L Bracket - This part is now OBSOLETE see 01-03090-01 01-03094-01 0.00 Qty. Pyrex Insert-large (used w/ 01-03090-01 or 01-03067-01) 01-03065-01 20.00 Qty. Wedge Polishing Clamp (used w/01-03090-01 or 01-03067-01) 01-03077-01 53.00 Qty. Heater Block for use with L-bracket 01-03096-01 65.00 Qty. Screw Clamp L Bracket Includes: 0509-073 nylon tip set screws OBSOLETE see 01-03090-01 01-03067-01 0.00 Qty. SEM Stub (used w/ 01-03067-01 or 01-03090-01) 02-03063-01 65.00 Qty. Glass Leveling Slide 0705-001 6.00 Qty. Microscope Stand 01-03075-01 65.00 Qty. Delrin Foot for Micrometer Assembly 01-03062-01 19.00 Qty.